Arab car crashes into barriers at hitchhiking station in suspected attack attempt; soldiers not wounded, driver in moderate condition. An Arab car slammed into the concrete barriers placed at a hitchhiking station near the Samaria territorial brigade of the IDF on Friday morning. It is suspected the incident may have been a terrorist attack attempt to run over soldiers. An initial investigation reveals that the Arab driver sped up and raced towards the hitchhiking stop for no reason. The two soldiers who were at the station were not wounded by the car thanks to the concrete barrier which was recently erected at the site, whereas the Arab driver was moderately wounded. Security and rescue forces are on the scene, and the Judea and Samaria district traffic police are investigating. IDF sources confirm suspicions that the incident is thought to likely be a terrorist attack. 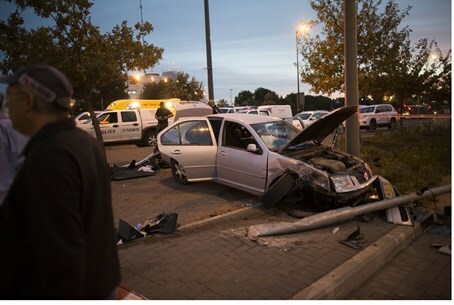 The incident comes after an attack last month in which an Arab driver rammed his car into three IDF soldiers in Judea's Gush Etzion region, seriously wounding them. The IDF flip-flopped over the attack, initially terming it an accident after the driver turned himself in, before eventually recognizing that it was indeed a terror attack.